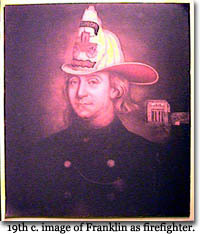 The "first" official volunteer fire department was formed by Benjamin Franklin. Under Franklin's goading, a group of thirty men came together to form the Union Fire Company on December 7, 1736. Their equipment included "leather buckets, with strong bags and baskets (for packing and transporting goods), which were to be brought to every fire. The blaze battlers met monthly to talk about fire prevention and fire-fighting methods. Homeowners were mandated to have leather fire-fighting buckets in their houses. Volunteer fire departments are an intergal part of safety and well being of communities all over the country. California is no different and here in Hayfork we have a Volunteer Fire Department. What does that mean? We don't do this job for a pay check, we do it because we want to protect our families and yours. A volunteer has a special place in their hearts that has a need to help others. If you have had thoughts about volunteering, now is the time! Hayfork Volunteer Fire Department is always looking for like minded people that want to train with a good crew of people and stand side by side when others are turning away. We have many opportunities for volunteering that do not include being on the front line of a fire.